My favorite late night indulgence is salami and cream cheese on crackers. Salty cured sausage, sweet creamy cheese, crisp buttery crackers, served with a refreshing chilled beverage...doesn't get much better than that! However there are a few problems translating this delicious little snack into the ideal appetizer for a crowd. The traditional method of applying cream cheese to the cracker and adding a piece of salami results in a soggy cracker if left in the refrigerator for any length of time. The sodden cracker was the most important hurdle to overcome, but then came the painstaking effort and endless trials I had to put myself and the family through to get the salami to cheese ratio just right. Somehow we endured and these addictive little roll-ups have solved all the problems inherent to serving these tasty tidbits to guests, as a bonus they came out rather beautiful in the process. Feel free to add additional ingredients to/instead of the green pepper, such as jalapeno, shredded cheddar, thinly sliced swiss, or hot pepper cheese depending on your mood. 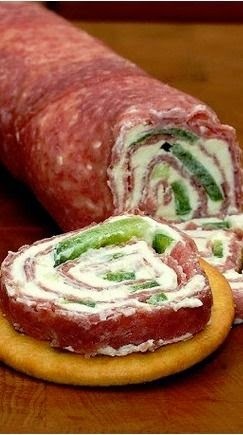 The three ingredients needed are raw, no actual cooking involved, but you will need a good sharp knife to cut the rolls. When entertaining I make up the roll 1-3 days ahead and on the day of the party I slice them thin and stack them in rows between wax paper, returning them to the refrigerator. To serve, I line a platter with crackers and then simply lay a sliced roll on each, they can be stacked pretty high with this method and it makes an impressive display. This keeps the crackers fresh and crisp but also makes assembly super quick and easy. Each roll will make between 55-70 crackers. Lay out a large piece of plastic wrap on the work surface. Place the cream cheese on top of the plastic wrap and cover with another piece of wrap the same size. With a rolling pin roll the cream cheese out into an even layer, approximately 1/4-inch thick. Watch the edges of the cream cheese as it rolls out because the top wrap can work its way under the cheese. To avoid this, occasionally pull the wrap off and replace it to continue rolling the cheese into a rectangle. Remove the top layer of plastic wrap and add the salami, overlapping the slices until all the cream cheese is covered, lightly press the salami into the cream cheese to make it stick. Replace the plastic wrap and carefully flip the salami and cheese so that the cream cheese is again on top. Remove the wrap and place the sliced green peppers over the cheese. Roll the salami over the cream cheese being careful not to leave any air space (this make it harder to cut later) and use the plastic wrap to pull it tight as you work. Roll the meat log and press the outer layers tight to hold it all together. Wrap the log in plastic wrap and refrigerate 4-6 hours or overnight (it can be cut without chilling, but the longer it chills the easier it is to cut.) Cut the meat slices thin, taste one on a cracker, as large crackers may need a thicker slice, while smaller crackers will need one cut thinner. Enjoy with your favorite beverage.